Most of the information contained in this site is for historical interest only, although I've updated some of the information as of 2007-07-16. Moved (and, accordingly, updated) these g77 pages to kilmnj.com from my my original web site. GNU Fortran (g77) is the Fortran development system for Project GNU. GNU means "GNU's Not UNIX(tm)" and is the primary project currently being worked on by the Free Software Foundation (FSF), a non-profit organization committed to the creation of a large body of useful, free, source-code-available software. GNU is intended as a replacement, wholesale and/or in pieces, for a complete UNIX system. 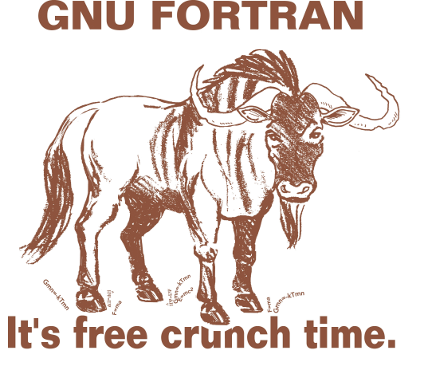 GNU Fortran consists of a compiler, run-time libraries, debugger support, and documentation. It supports ANSI FORTRAN 77 conformance, plus popular extensions to Fortran including some ANSI/ISO Fortran 90 features. GNU Fortran is still considered to be in (public) beta testing, and has been since February 17, 1995. The Free Software Foundation and the g77 developers would like to continue improving g77 until it is perfect. If g77 doesn't meet your needs at the moment, please let them know why. More on what constitutes g77, including its relationships to f2c, gcc, and gdb. 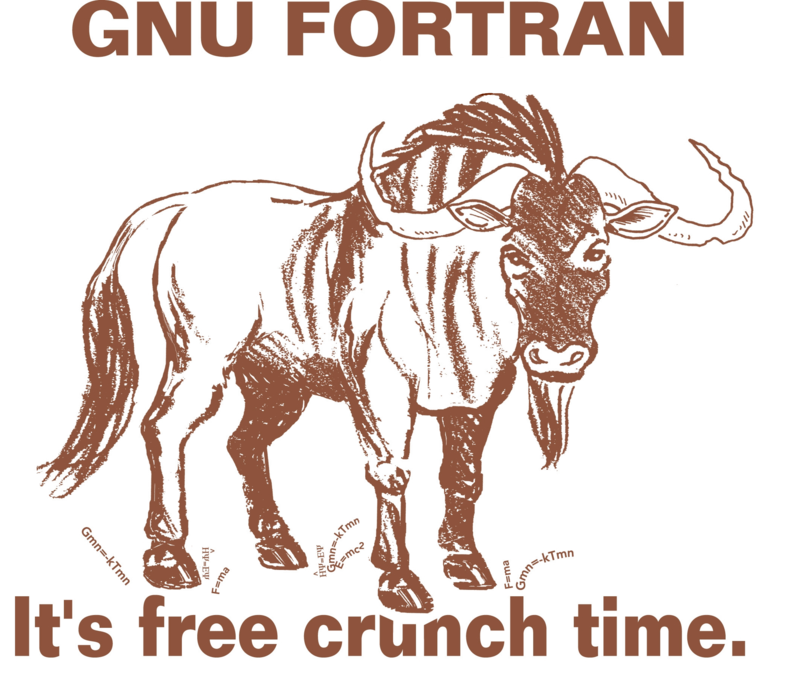 Please consider funding ongoing development of GNU Fortran. As the motto implies, g77 pertains to the "number-crunching community". This community includes people and organizations that design things like buildings, bridges, and ships; that forecast the weather; that monitor seismic data to predict earthquakes, volcanic eruptions, or locate oil deposits; and so on. More on who uses g77. How Will GNU Fortran Progress? As with all free software, GNU Fortran, or g77, will continue to progress and evolve as directed by those who take the time and make the effort to test, fix, and improve it. While the "loss" of the original author of a product like g77 can take some steam out of the energy driving its development, it can also set the stage for fresh inspiration as well as for discovering new sources of perspiration. If you're willing to help out, please email gcc at-sign gcc.gnu.org with your ideas or suggestions. Note that this email address is a mailing list with a huge number of subscribers (it has some "spam protection" as well, however), so take that into account when writing your message. Regarding my departure from the project, read why I'm stopping my g77 work. Also read about what I think is next for g77. Where is GNU Fortran Developed? GNU Fortran (g77) is developed, tested, and also used by a large number of people around the world. Emails have been received by the developers from users in China and Cuba, as well as from most countries well-represented on the Internet. On the Internet, the center of development is The GCC Project as well as The G95 project. The GNU Compiler Collection (GCC) project is where to find the most current release of g77. Development of GNU Fortran 95 is now taking place. Development and maintenance of g77 continues. More (mostly obsolete) development news regarding g77. Information on most-wanted features in g77. Information on the Year 2000 (Y2K) readiness of g77 is available. If you're interested in seeing how well your Fortran compilation system does aligning DOUBLE PRECISION variables to 64-bit boundaries, try my align package. If you just want to see how the GNU Fortran compiler versions do, you can just read the output of the package, instead of obtaining and running the package yourself. Since I'll no longer be working as a volunteer on g77 beyond GCC 2.95, it is no longer appropriate to donate funds to me with the idea that they'll fund future development. I don't mind receiving funds for appreciation of my past efforts, or for other reasons, of course! Consider contributing to The G95 project instead. Many past (pre-1998) contributors to g77 received goodies as a means of saying "thanks". To obtain important announcements about g77, send email asking to be added to the info-gnu-fortran at-sign gnu.org mailing list. For information on other pertinent mailing lists, see the g77 documentation, and the Project GNU web site. Work on g77 currently is mostly within the domain of the GCC project, which is producing versions of GCC starting with 2.95. See http://gcc.gnu.org/ for more information, including mailing list, mailing-list archives, on-line documentation, and so on.